Still stuck for NYE ideas? Well if you are looking for high-end elegance and expensive frolics, says John Hillman, why not pop along to the Moulin Rouge NYE party in Paris. Oh la la! Just how spectacular a New Year’s Eve will you be having this year? 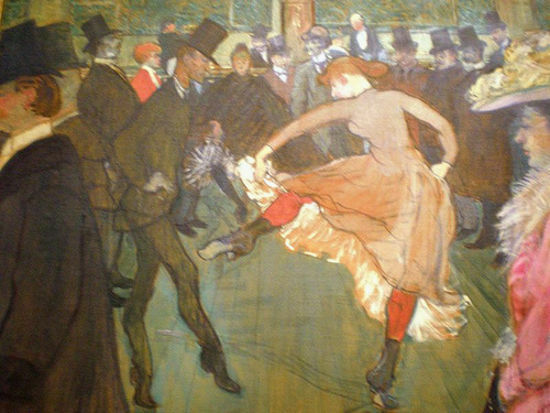 My guess is that – no matter how indulgent you think you may be – you won’t be coming anywhere near to reaching the dizzy heights of luxury and excess found within the walls of the Moulin Rouge, Paris. This year’s big end of year party includes all the glamour of the dancing girls along with caviar, lobster and champagne. I have to say that there does seem to be something quaintly old fashioned about the way that Moulin Rouge’s NYE Party has been presented. For a start the menu carries all those rather dated sounding ‘status dishes’ that seemed really exotic when James Bond ordered them back in the 1970s – French Fresh Caviar, Blinis and Swiss Cream, Blue Lobster Bouquet and Fillet of Charolais Beef, all washed down with Taittinger Comtes de Champagne 1998. The meal stretches to a good French seven courses and will all be lovingly prepared by Michelin Star winning chef, Laurent Tarridec. So dinner and dance with the Moulin Rouge Orchestra, followed by a midnight show that’s been specially put together for the occasion, followed by a DJ, dancing and even posh party gifts. It all sounds so classically cheesy and fun. Brussels – dull European politics, jazz, potato fries and beer right? Well yes, but that’s far from all there is to this captivating and bizarre city; the capital of Europe features one of the most eye catching monuments in any European city, the Atomium. A piece of accidental art, it’s an iron molecule enlarged 165 billion times, 102 metres tall, clad in stainless steel. There’s nothing haphazard about its design, but the Atomium is accidental because it was never meant to be a permanent structure. It was designed for the 1958 World Exhibition in Belgium by engineer André Waterkeyn and architechts André and Jean Polak. The Atomium was renovated from March 2004, February 2006 and the old aluminium sheets were replaced with stainless steel. The old aluminium was sold off as souvenirs to pay for the renovation. In a mark of just how popular it is to Belgians, a special €2 coin was released to celebrating the renovation being completed. 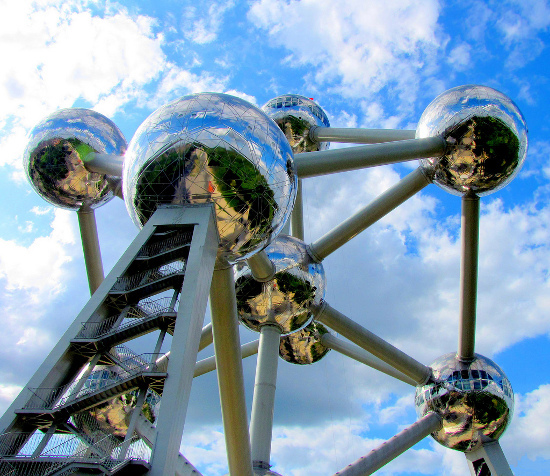 Those spheres aren’t just for staring at either; there’s a permanent exhibition dedicated to the 1958 Exhibition in the two base spheres, temporary exhibitions of art, and from the very top sphere you can get “only true panoramic view of Brussels”. At 102m it’s not for vertigo sufferers but the view is so good that to the North East, in clear weather, you can even see Antwerp over 40km away. Skeletons and skulls aren’t what normally spring to mind in Paris, the city of Moulin Rouge and kisses atop the Eiffel Tower, but literally underneath the those romantic streets is a spooky secret world. The Catacombs of Paris are once again open to tourists who feel like seeing a heart stopping and rarely seen side of Paris. After vandalism in September, much needed restoration work was undertaken and it will now re-open at the start of January according to the Paris tourist board. Since Roman times Parisians buried their dead on the outskirts of the city, but as the city expanded the grave yards became too full and bodies contaminated the groundwater. Police Lieutenant General Alexandre Lenoir hit upon the idea of using the underground tunnels and quarries that honeycombed Paris to store the dead. By 9 November 1785 the council of state agreed to remove the dead from the Cemetery of the Innocent. The procedure began on 7 April the following year. The bones were transported on black shrouded carts, through Paris streets lit only by flickering lanterns, accompanied by priests solemnly singing the funeral rites. Almost six million Parisians were transferred and interred in this way, along with grave stones and memorials from the cemeteries. If neat rows of bones all sounds a little macabre, well it is but in a good way. 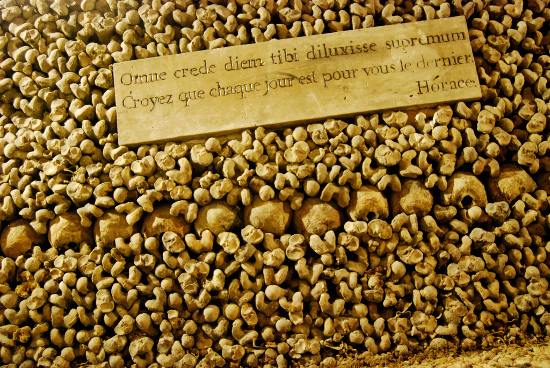 The dead here are treated respectfully and the ossuary was a practical solution to a sensitive problem. People often worry about the smell, but beyond the odour of damp you get in any cellar it’s fine. The Catacombs are lit, but anyone remotely claustrophobic or unnerved by the sight of bones it’s not the best idea. There are only 2km of the tunnels open to the public and the well lit walk takes around 45 minutes, it’s cold down there so take coat. And don’t stray from the path, who knows what stalks those tunnels! €8 for adults, €6 concessions, free for under 14s. Guided tours must be booked four weeks in advance. Access is at 1 Place Denfert-Rochereau, 75014 Paris. Nearest metro is Denfert-Rochereau. Snow is falling all around, children playing, having fun. Yeah but it melts to slush and now everyone’s wet and miserable, so why not grab your gear, a car and head for the winter festivals for snow, music and good times. Altitude Festival, 20th March – 26th March 2010. 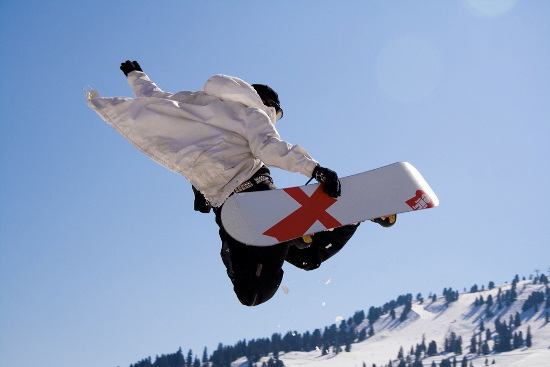 Altitude was co-founded by two English comedians, Andrew Maxwell and Marcus Brigstocke, both committed snowboarders. In the venues there will be bi-lingual comedy from Maxwell and Brigstocke, Phil Jupitus and more soon to be announced. Headline acts announced this year Newton Faulkner and the Cuban Brothers and more is sure to follow along with some top quality DJs. Snowbombing, 5th April – 10th April, Mayrhofen, Austria. Mayrhofen may be bit of a drive but it’s worth it – snowbombing is the undisputed Ice Queen of winter festivals. There’s some of the very best dance acts, DJs and bands already announced. This year Fatboy Slim, Editors, Doves, the Enemy, 2manydjs, Friendly Fires, Vitalic, De La Soul, Dan Le Sac vs Scroobius Pip and the Scratch Perverts, among many others will be bringing their beats. Most accommodation is within 10 minutes walk of the venues, and there will be Jacuzzis, seven different types of saunas, spa-centres, pools “and enough steamy sauna type behaviour to make you forget you’re British” according to the organisers. According Dizzee Rascal “It’s like Ibiza in the snow”, and if it’s good enough for Dizzee it’s good enough for me. The Big Snow Festival, 14th March – 21st March 2010, Arinsal, Andorra. Headliners include Calvin Harris and Eddie Halliwell and the rest of the acts are strictly towards the DJ/dance end of things – not one for the indie kids. The snow will be thinning out as the season comes to a halt, but that also means emptier slopes. If you felt like really making a party of it you could also leave Big Snow and head on over to Altitude, of course you would have to love music and snow. Yeah thought so, grab your board and let’s get gone. Ferries are a great way to get there – you can take your own car and more importantly don’t have to faff about with hiring gear and paying through the nose for it. In Brussels the surreal works of artist René Magritte have come alive. Rosie Khdir takes a wander around the Musée Magritte. Men in bowler hats raining from the sky, paintings within paintings, giants eggs in cages, slices of ham with eyes, concealed faces? 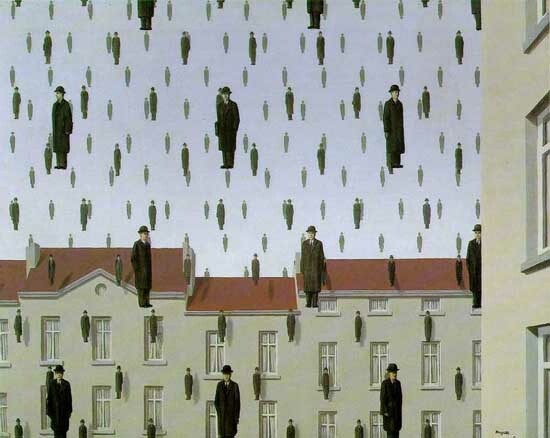 These are just some of the dream-like creations by René Magritte. Magritte was born in the Hainaut, in 1898 and by 1914 had moved to the capital to study at the Académie des Beaux-Arts. He started out as a poster designer but in 1926, after being inspired by The Song of Love by Giorgio de Chirico, he created his first surreal artwork, The Lost Jockey. Following lots of negative press about his exhibition held in Brussels in 1927 Magritte moved to Paris and became involved in the surrealist group. As the recession hit in 1929, Magritte returned to Brussels and set up an advertising agency with his brother. Throughout the 1930s, Magritte was very productive. He had his very own show in New York in 1936 and then later one at The London Gallery. This decade is where Magritte produces many of his infamous surrealist pieces such as The False Mirror (1935), The Human Condition series (1933, 1935) and Not to be reproduced (1937). The Museé Magritte celebrates the life of this influential artist and his contributions to the art world today. It contains over 200 works including in oils on canvas, gouaches, drawings, sculptures , painted objects, advertising posters, music scores, vintage photographs and films all produced by Magritte. The exhibition is spread out in three levels of the Royal Museums of Fine Arts of Belgium located at the Place Royale. Each level focuses on a different time period in his life; the first floor dates from 1898 to 1929 and is centred on early years, his marriage to Georgette Berger, his involvement in the Brussels surrealist group and his life in Paris. The second floor looks at his self professed “Idiotic Work”, his life in Brussels, his experiences with Communism during the war, Surrealism in full Sunlight and the “vache” period. The third floor takes a look at The Enchanted Domain which encompasses his entire painterly universe. He also explored the medium of film in his later years and this part of the exhibit takes a look at the short films he made between the years 1956 and 1960. You will see that his works are definitely sights that have never been seen, they evoke curiosity and awe in everyone and are definitely worth a peek. The museum is open Tuesday to Sunday 10am to 5pm. Check the website for holiday opening times. 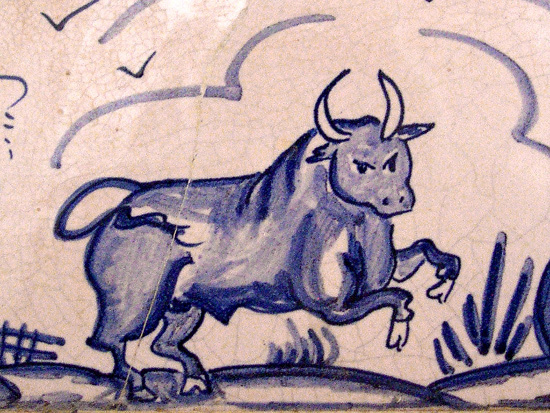 Tomas Mowlam looks at the news that Catalonia in Spain may soon ban bullfighting. The vote in the Catalonian regional parliament today narrowly passed with 67-59 vote and five abstentions, to debate a law which could lead to a ban. It’s a narrow victory, but a victory none the less for animal rights activists, who argue that other cruel sports like bear baiting have disappeared from Europe so why should slowly killing an equally big mammal, in an equally cruel way, have the protection of the armour of tradition and culture? The vote came about after a petition was started with 180,000 signatures against the brutal sport by Prou! (Catalan for enough) and it has become a touchy subject. Brigette Bardot has even waded in, with a letter to the Catalan Socialist Party which said bullfighting was “an incredibly sadistic spectacle”. AP reported that “the issue proved so sensitive and divisive that Friday’s voting was kept secret, a rarity in the Catalan legislature. Some in the pro bull fighting community have said that it’s just a way of Catalonia distancing itself even more Spain; it has its own language, culture and substantial regional autonomy. The motivation doesn’t matter that much though, what’s important is that this could be real step forward for preventing cruelty to animals in Spain. “The parliament has recognized that this is a subject that society is concerned about. Now for the hardest part, winning the legal battle,” said Proud under a banner reading THE MPs SAID YES on their website. If Catalonia does ban bullfighting it will be the second Spanish region to do so after the Canary Islands in 1991. Matadors were once great stars but its popularity has declined, and the only bull ring in Catalonia is in Barcelona. It’s still big in Sevilla, Madrid and Pamplona, and some Catalonians are worried that it could hurt the tourist economy as well. What? The majority of people who come to Barcelona don’t do it for the bullfight, a spectacle which is pretty stomach churning. Christmas is a time for heart warming stories, says John Hillman, so what better way to start the festive countdown than with a story of loss, high seas adventure and, of course, a very happy ending. With Christmas approaching, and the pantomime season upon us, it looks as though we have a new ‘famous feline’ tail to tell, one to join our regular festive favourites such as Eliot’s Macavity and Puss in Boots. 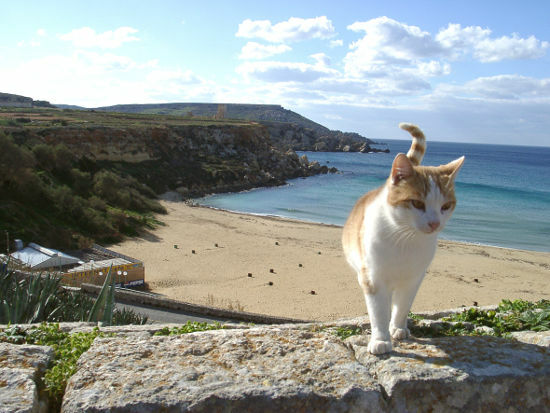 Sandi the Seacat tells the tale of a remarkable ginger tom who went out for his usual Friday night stroll and, through a series of mishaps, found himself onboard The Pride of Bilbao and bound for Spain. How Sandi managed to get all the way from his quiet patch of backyard territory to the hold of a P&O Ferries ship remains a mystery, but his owners, Tim and Patricia Austin, from Lee-on-the-Solent on the outskirts of Southampton, are convinced that he was the victim of a sinister catnapping. Said Tim Austin, who spoke to Portsmouth Today. Indeed once Sandi was discovered by P&O Staff, wandering the car decks of the ferry, he became the one of the first cats to experience P&O Ferries’ famous hospitality on the Portsmouth to Bilbao route. And for one of the greatest jazz musicians Paris was a place that felt like home. Miles Davis’ love affair with Paris is being celebrated in the new exhibition at the Musée de la Musique, called We Want Miles – Miles Davis: Jazz Face to Face with Its Legend. 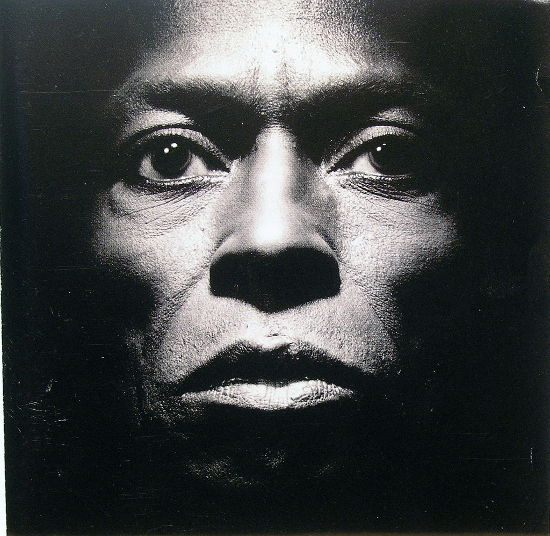 “It follows Miles Davis’ musical and personal journey, from his hometown, East St-Louis, to his retrospective concert at La Villette in Paris, just a few weeks before his death,” according to the exhibition organisers. It’s the 50th anniversary of Kind of Blue, an album which holds that special status of being a record that really transformed music, influencing not just different genres but art and literature as well. And what better time to look back at a man called the Picasso of jazz; Miles was at the front of every major innovation in post war jazz from bee-bop, to the birth of cool, large orchestras, then electric and funk. The list goes on. The exhibition not only features music scores, videos, photos but instruments including seven of Miles’ trumpets. Paris was a special place for Miles, and he was equally loved and admired by the city. It was the first foreign city Davis ever visited and it was one of the last cities he played in before his death. In 1949 the 22 year old musician travelled to play the first Paris jazz festival since the end of WWII. He was already a well respected trumpeter at home, but because of his skin he was still a second class citizen in a USA where segregation and prejudice were horribly common. He came to Paris with Tadd Dameron as part of a quintet, and through Boris Vian, a French writer, poet and trumpeter he met Picasso and Sartre. It wasn’t just the people that he met that had such impact on the young Miles, it was that in Paris he was treated as an equal: here he fell in love with the white actor and singer Juliette Gréco, something that would have been unthinkable in the USA. Leaving her and returning to America, where jazz was in commercial decline and his race held him back, led to his four year heroin addiction. He returned to Paris clean in 1956 and kept coming back throughout his career. France honours artists more than perhaps any other European nation, and in 1989 Miles was given the Grande Médaille de Vermeil by then mayor of Paris Jacques Chirac. Two years later was made a Knight of the Legion of Honour, the highest award in France.